Free Printable First Communion Certificate. Free Printable First Communion Certificate that you can fill and print. A great free certificate that you can fill the information, print and save time and money. Includes a beautiful first communion background and blue frame with message “received The Holy Eucharist for the first time”. Print this beautiful First Communion Certificate free using your laser or inkjet printer with best quality settings and quality white certificate paper. The PDF certificate includes form fields to make easy to write directly in the PDF. Just write the name, church, city, state, date and Pastor or Minister signature. 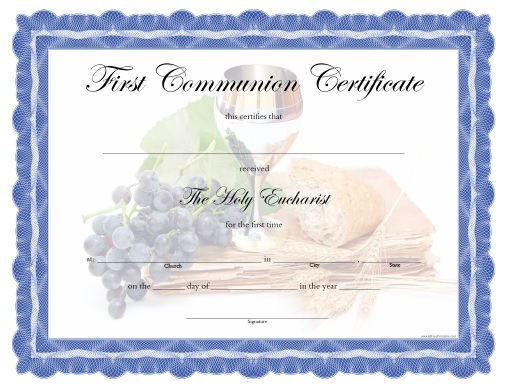 Click the link to download or print the First Communion Certificate free in PDF format. beautiful! is there a way to rotate the certificate to fit landscape rather than portrait? It was made in landscape orientation. You should check you printing settings. Thanks for your comment.